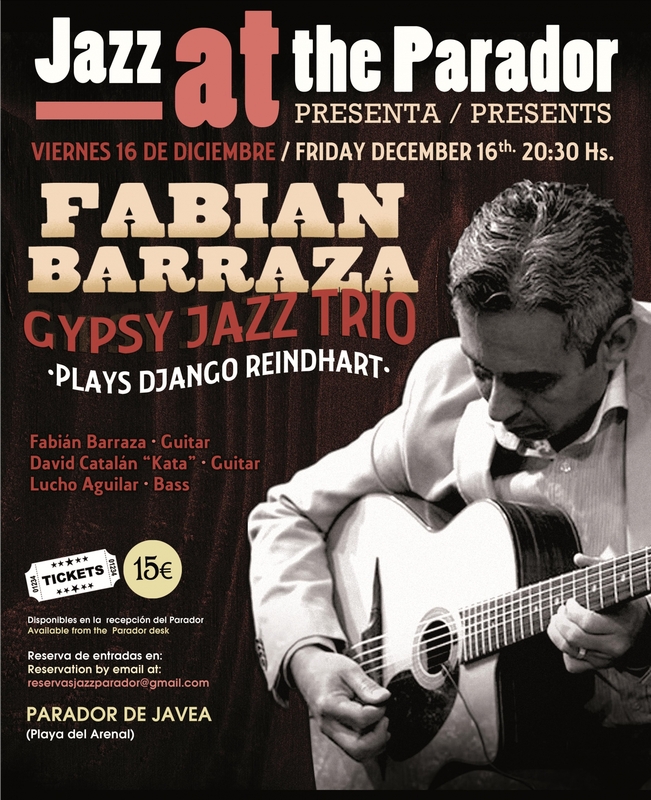 Into the Cicle “JAZZ AT THE PARADOR”, on Friday December 16th at the Parador of Javea located in Arenal Beach, concert at 08’30 pm by FABIAN BARRAZA GYPSY JAZZ TRIO remembering Django Reindhart. After their brilliant performance at ‘Jazz at the Parador’ two years ago, Fabián Barraza Gypsy Jazz Trio returns with their amazing Jazz Manouche formation. One of the most exciting groups on the Spanish jazz scene, they enthrall audiences at jazz festivals and auditoriums across Spain. His great understanding of Gypsy Jazz and his original rhythms have made Fabián Barraza an essential part of the jazz scene in this country.